The central part of the display is occupied by vases from the Middle phase (c. 590-570 BC) of the Corinthian period. 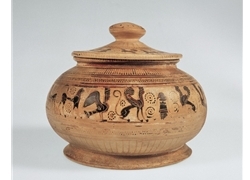 They include a brilliant fake, a small, lidded pyxis by a well-known Athenian forger's workshop of the 1930s. Another pyxis, this time ancient, whose decoration is already tending in the direction of a delicate mannerism, can be seen behind the fake. One of the two pyxides to the immediate left of the latter is decorated with a scene of boar-hunting, an example of human figure composition otherwise rare on Corinthian Orientalising vases. The animal frieze on the oinochoe (wine-jug) with trefoil mouth shows the pure silhouette-style. In the focus of the display stands a distinctive Corinthian version of the krater, or bowl for mixing wine and water, the centrepiece of the Greek symposion. Underneath it to the left is a ring-aryballos decorated with an animal frieze. The shape was of Near Eastern origin. The vases to the left were made for the most part in the Late Corinthian period (second to third quarter of the sixth century). They illustrate the painters' gradual loss of technical control, the increasing roughness of the drawing, the gradual exhaustion of the old subjects, and, finally, the disappearance of figural decoration altogether. The production of the undecorated miniature vases similar to the group exhibited continued long into the fifth century. The causes of the decline in artistic quality are to be sought in the workshops' slide into mass-production to meet the ever-increasing demand for Corinthian vases overseas and, in the Late period, in the competition of the Attic workshops. By the mid-sixth century BC these had forced the Corinthian products out of their old extensive Mediterranean markets.